Multiples provided so size is adjustable. 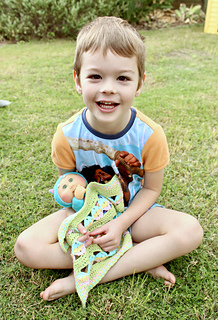 As a Mum, my favourite part of Easter (besides chocolate for breakfast) is the Easter Egg hunt with my son. I love hiding the eggs and then watching the complete joy on his face every time he finds one! It’s one of those moments of pure joy that simultaneously takes me back to childhood and makes me feels completely happy with my life in this moment. 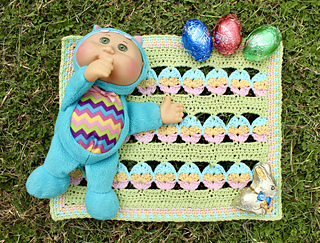 So, in celebration of the egg hunt and childhood, I have designed this cute little blanket to look like colourful eggs lined up on the grass just waiting to be picked up and gobbled up! 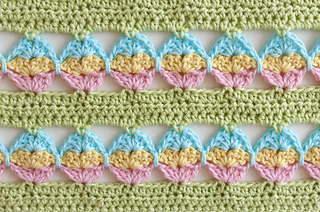 The pattern uses simple stitches and colour changes at the end of each row to create these lovely eggs. 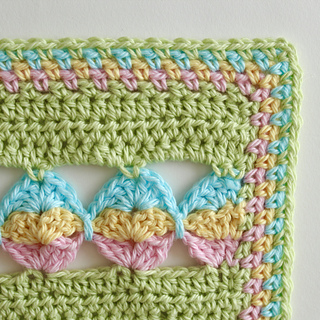 Stitches used: Foundation half double crochet (or beginning chain and hdc), sl st, ch, sc, hdc, dc. 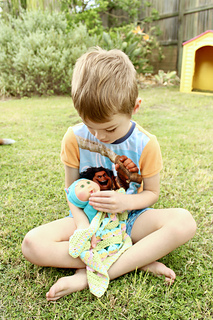 Yarn: Any DK (8ply) weight yarn would work. I used Bendigo Woollen Mills 8ply cotton in Honeydew, Pink Rose, Daffodil and Arctic. You could use a different weight yarn though this will affect the size and you may need you adjust your starting count accordingly. 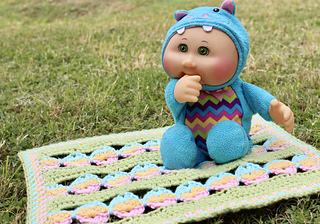 For a larger blanket I would try 30 x 6 = 180 + 3 = 183. By my calculations this would make the blanket about 1 metre (39 inches) wide. Multiples so you can adjust the size to your needs. Please note that this is a downloadable, printable PDF version of a tutorial that is available for free on my blog. You may sell items created using this pattern. 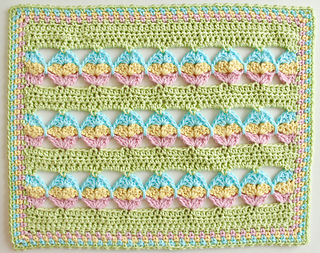 Please credit Mikaela Bates - Vivid Kreations for the design and consider linking to this pattern if selling online.